It seems that I’m just itching to cast on a bit of everything right now. It’s perhaps a combination of knowing I have a substantial stash and should knit it up, wanting to knit gifts for people for Christmas and knowing that’s not that far way off and seeing such great inspiring knits around that beg to be casted on. First we have another Shifting Sands scarf. This for me is my 3rd which I find interesting for me because I’m typically not a repeater but when you have mmmmmalabrigo and a fantastical pattern it’s hard not to want to make it over and over again. This time I casted on 37 instead of the 42 from the other Malabrigo SS scarf I did. I think the width is just right and will length the scarf a bit too. The two other scarves were presents and this one is for moi! I also have a Tilted Duster on the needles. (No pic due to lack of sunlight and black yarn!) I ended up getting the yarn with a friend of mine and we’re trying to do a bit of a knitalong together. The back and fronts were done in no time and I’m now on to the sleeves. I suspect the skirt to be the longest timewise portion for this sweater. I love the uniqueness of the construction of this sweater and hope the black yarn won’t hide it. I am hoping for a jacket that can really be dressed up and down and no color does that better than black. – Fingerless gloves, like the mitts above with a funky pattern – may just wing it. – Hats! I am ever inspired by looking at Knitkid’s on Flickr – he makes me want to just take a few colors and just cast on and see what happens. He even has a book coming! Sign me up for that! – Those cute knitted bangles as seen on Knits&Pieces and Si Mi Knit. I think that’s good for now to keep me busy through to the new year. However you know me come tomorrow there may be something that will just blow those ideas away. That Shifting Sands is really calling my name as well! Your shifting sands is looking great! That rose colour is amazing. Can’t to see WIPs of your duster! 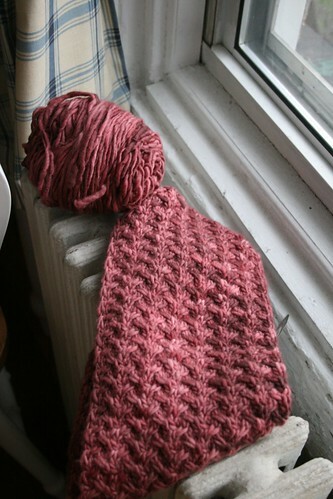 I love that shifting sands scarf….so pretty – and that will be a super cozy one!! Your scarf is lovely… that might be added to the queue, too. The skirt on the Tilted Duster does take forever, but it’s worth it when you are finally finished. This is beautiful! Love the way the color shifts. You are seriously making me want to cast on for one of these. I have an unassigned skein of malabrigo in the stash right now….hmmmm.